A WBGT device is a measurement tool that uses ambient temperature, relative humidity, wind, and solar radiation from the sun to get a measure that can be used to monitor environmental conditions during exercise. 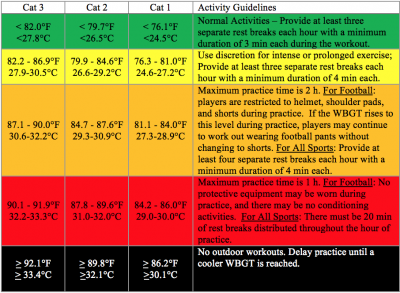 Establishing WBGT guidelines that dictate modifications in activity (work:rest ratios, hydration breaks, equipment worn, length of practice) at given WBGT temperatures play a huge factor in helping to prevent EHS. As environmental temperature and humidity increase, there is an increase in the heat stress that is placed on the exercising individual. Exercise in the heat causes athletes to rely on evaporation of sweat from the skin as the primary method of dissipating heat that is produced by the working muscles. As humidity increases, the ability to dissipate heat through evaporation is further hindered, thus causing the body to have an increased body temperature, which increases the risk of EHS. When examining deaths that have occurred from EHS during American football, most of the deaths (~65%) have occurred during the month of August in the eastern quadrant of the US. In addition, over half of the reported deaths occurred during morning practices when humidity levels were high. These results show a direct correlation between increased temperature and humidity levels and risk of mortality as a result of EHS. The use of WBGT as an environmental monitoring measure during exercise in the heat was invented in the early 1950’s in response to the number of heat casualties occurring in the United States armed services that occurred during the 1940’s and 1950’s. For example, from 1942-1944, 198 soldiers died due to heat illness during military training. In response to the large number of heat illness cases, the military began to make modifications to training sessions when environmental conditions reached extreme levels. Initially, temperature and humidity levels were used when making training modifications and were later changed to using WBGT as a preventive measure to protect against heat illness. After implementing WBGT policies in the military, there was a drastic reduction in heat illnesses during basic training. As mention above, WBGT utilizes ambient temperature, relative humidity, wind, and solar radiation from the sun to get a composite value that can be used when monitoring environmental conditions during exercise in the heat. The equation below uses all of these components to calculate WBGT. In today’s world, there are plenty of companies that produce WBGT monitoring devices that can be used to accurately assess WBGT. 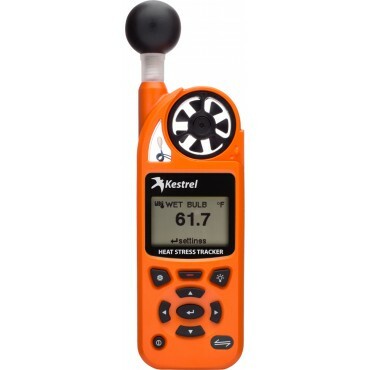 A couple of examples are depicted below (Left: Kestrel 5400 Heat Stress Tracker, Right: QuestTemp). In some instances when a WBGT monitoring device is unavailable, a chart like the one shown below can be used to estimate WBGT. It must be noted that these are estimates and are derived only from using temperature and relative humidity and the chart accounts for full sunshine and light wind conditions. Thus, depending on the radiant heat load from the sun and the wind, the actual WBGT reading could be different from what is on the chart. As it was mentioned above, WBGT can be used to establish guidelines for activity modifications during physical activity in the heat. School sanctioned athletics programs should use WBGT as a preventive measure against the heat. For example, the Georgia High School Athletics Association, amongst others, passed guidelines that mandate all state high schools measure WBGT and make necessary practice and game modifications depending on the WBGT reading. The guidelines are specific for the length of practice, number of breaks, and equipment that is allowed to be worn depending on WBGT temperature. When establishing WBGT guidelines for physical activity, the guidelines must be region (geographic) specific. For example, an athlete playing football in Louisiana may be accustomed to warm environmental conditions, unlike a football player from Maine. A football player practicing in 90°F temperatures in Louisiana could be comfortable whereas a football player practicing in the same conditions in Maine could be experiencing the worst conditions they have felt all year, which would increase the risk of heat illness. To find what region your state/organization is in, please read the Grundstein et al. Regional heat safety thresholds for athletes in the contiguous United States. Appl. Geography. 2015. The authors have scientifically identified three regions for the United States. 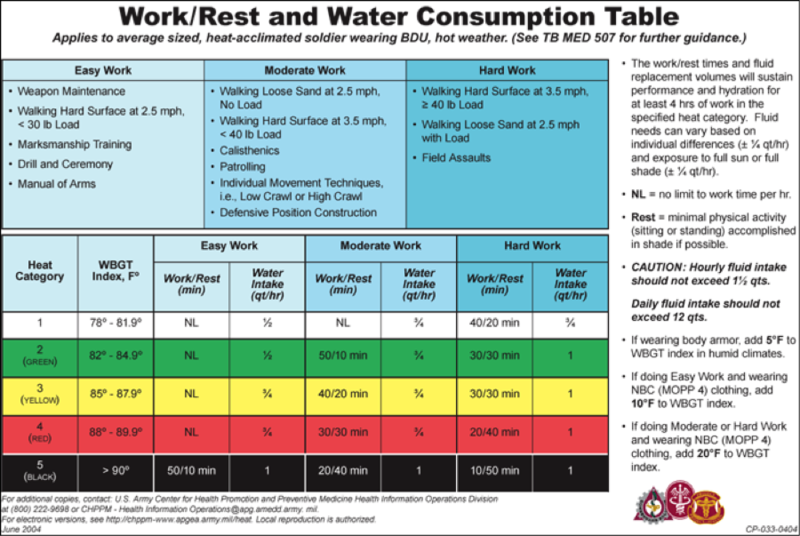 Below is a heat safety table modeled off the Georgia High School Athletics Association guidelines for environmental modifications. This table, also adopted from Grundstein et al. Regional heat safety thresholds for athletes in the contiguous United States. Appl. Geography. 2015, provides a guideline for modification of activity based on the environmental conditions in your region. In addition to school sanctioned activities, the United States Military uses WBGT to modify basic training during extreme conditions. The chart below shows the modifications that are used during basic training. Similarly, Occupational Safety and Health Administration (OSHA) uses the same guidelines that are used in the US military to modify work for individuals involved in manual labor jobs such as construction workers, steel mill workers, firefighters, law enforcement officers, etc. WBGT has been shown to provide an accurate measure of environmental heat stress. WBGT can be used as a preventive measure during exercise in the heat by making activity modifications as WBGT rises. When developing guidelines for activity modification using WBGT, it is necessary to include work:rest ratios, length of activity, hydration breaks, equipment to be worn (if applicable), and a level in which activity is cancelled. WBGT guidelines must be region (geographic) specific since temperatures fluctuate differently by regions. People’s response to exercising in heat may vary by the geographic region in which their usual exercise sessions take place. WBGT modifications should be fluid, meaning that if the conditions get more restrictive during the day or a particular practice, modifications should be more restrictive. As environmental conditions become more mild, modifications should be less restrictive. See details on US Soccer’s policies for environmental conditions. Bergeron MF, McKeag DB, Casa DJ, et al. Youth football: heat stress and injury risk. Med Sci Sports Exerc. 2005;37(8):1421–1430. Budd GM. 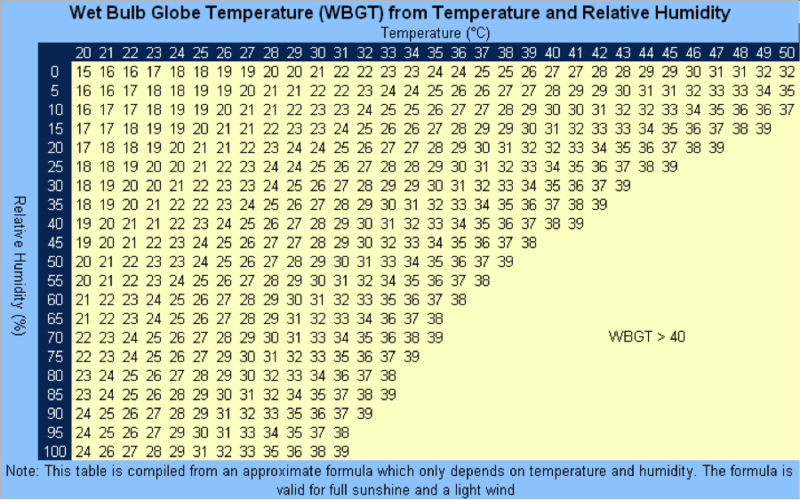 Wet-bulb globe temperature (WBGT)–its history and its limitations. J Sci Med Sport Sports Med Aust. 2008;11(1):20–32. Casa DJ, Guskiewicz KM, Anderson SA, et al. National athletic trainers’ association position statement: preventing sudden death in sports. J Athl Train. 2012;47(1):96–118. Grundstein AJ, Ramseyer C, Zhao F, et al. A retrospective analysis of American football hyperthermia deaths in the United States. Int J Biometeorol. 2012;56(1):11–20. Kerr ZY, Casa DJ, Marshall SW, Comstock RD. Epidemiology of exertional heat illness among U.S. high school athletes. Am J Prev Med. 2013;44(1):8–14. 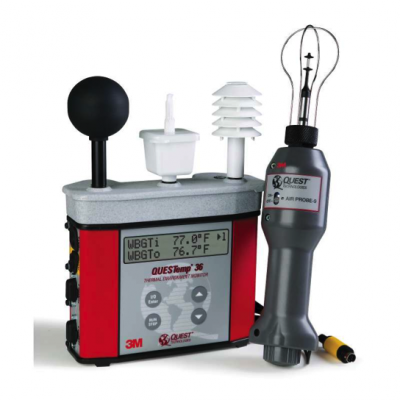 Parsons K. Heat stress standard ISO 7243 and its global application. Ind Health. 2006;44(3):368–379. Stearns R, O’Connor F, Casa D, Kenny G. Exertional Heat Stroke. In: Casa D, ed. Preventing Sudden Death in Sport and Physical Activity. Sudbury, MA: Jones & Bartlett; 2012.